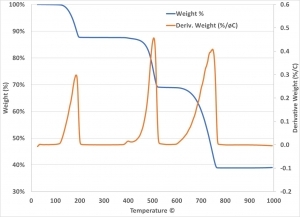 Thermal gravimetric analysis (TGA) is a thermal characterization method that measures the mass of a sample over time as the temperature increases at a determined rate. The main use is to detect chemical based changes that include decompositions of volatiles, solid-gas reactions and chemisorption’s based on temperature. The instrumentation itself is rather basic and is called a Thermogravimetric Analyzer. It is equipped with a furnace that has a precision balance with a sample pan and programable control for temperature that enables precision heating ramps. 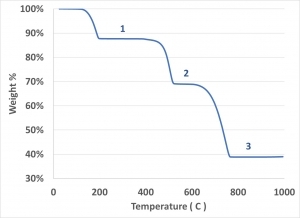 The temperature is normally increased at a constant rate to induce the thermal reactions. The atmosphere within the furnace can be changed based on the experimental conditions required for testing. The input gas into the furnace can be ambient air, Nitrogen or gases that provide an oxidizing or reducing environment to determine how the reaction of the samples changes. Each of these reactions has a decomposition byproduct of water, carbon monoxide and carbon dioxide, respectively. Figure 1 displays the TGA data of the calcium oxalate sample. Each of the 3 plateaus in the graph represent the point at which the decomposition process is complete. The water (1) has been removed at approximately 200 °C. Each of the 3 decompositions has a corresponding weight loss associated as shown in Table 1. Based on stoichiometry, a theoretical weight % loss can be calculated for each of the 3 different reactions. Table 1 compares the theoretical values to that of the measured values and a very good agreement is shown. Figure 1. TGA Data for Calcium Oxalate. Another common method to display TGA data is shown in Figure 2 which overlays the 1st derivative of the Weight % curve. The peaks of the derivative curve represent the point of largest rate of change in the Weight % curve and are also the inflection points. Each of the 3 decompositions of the Calcium Oxalate has a corresponding inflection point as shown in figure 2. Displaying the data in this manner makes it easier to decipher the temperature of greatest mass loss in the sample. Figure 2. TGA data of Weight Loss % and Derivative Weight Loss for Calcium Oxalate. Based on the TGA measurements shown, it confirms that Calcium Oxalate is a repeatable and simplistic material to ensure TGA calibration. Many end users will have this material on hand to use as a calibration standard before performing more complex materials or even to confirm results of mystery or difficult specimens. The results of TGA of CaC2O4.H2O are well known and easily confirmed to ensure that the TGA device is in proper condition.